I don't know why so many people are intimidated by a formal table setting. These things should have been taught to you as a child. Just the basic starting from the outer utensils and working your way inwards will suffice. That alone should help you out of certain sticky situations. Also, it's not very likely you'll be attending many out-of-this-world-formalities, unless perhaps you join the diplomatic corp. Lynn Rosen's charming book is full of interesting information on china, silver, crystal, napkins and tablecloths, and table decor. I loved the history of some table traditions as well as the wonderful napkin folding instructions. Little touches like this will go a long way to upping the elegance of your table. She tells us about many different plates and bowls and their uses (thankfully a charger plate isn't necessary - too bulky in my opinion) which are vast and can be too cumbersome nowadays, and about the incredible array of silver, much of which you rarely come across anymore. If the variety of forks is daunting, look at the glasses - staggering. I enjoyed Ms. Rosen's "Top ten terribly tacky things to do at the table" (one of the reasons I'm writing a book on manners) which should be read and studied by all of those who eat at a table and in company. Not that many people have a full complement of cutlery (flatware) these days, but if only to know what goes where, and which piece to use for which course, will fill you with confidence. I've been searching high and low for a sugar spoon with little holes in it to "sift" the sugar. Any ideas? 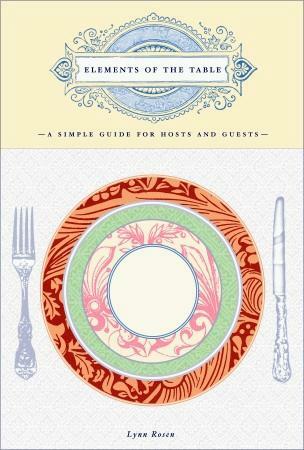 Conclusion - This handy little book is essential in any host's home. It would also make a fab gift to a new homemaker.